Easter is here! This calls for a celebration. You want to celebrate it by joining an Easter Egg Hunt. However, there is no such event in this house. People in this house would rather celebrate it by partying. This is not what you want to do. The good news is, there is an Easter Egg Hunt downtown. You can freely join there but first, you have to find a way to escape from this Easter Party. It is not easy to escape from this party but there are clues that can help for your escape plan. On the other note, there are puzzles in the room that you need to solve before you can escape completely. 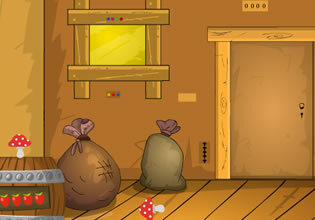 But you should not worry too much because there are items in this room that you can use to solve those puzzles. All you have to do is to use your logic to finish everything. You can't miss the Easter Egg Hunt for the world so you have to escape as fast as you can. Easter Party Escape (8b Games) is a brand new room escape game by 8b Games that will test your logic and your escape skills. Good luck and have fun!